This is a very ancient story. But isn’t it exactly what we’re up against in our struggle to reduce poverty and inequality in the 21st century? We are still coming to grips with the Federal Budget, with its measures that would rip the guts out of what remains of a fair and egalitarian Australia. Like forcing young people to live on fresh air and sunshine for six months of every year, forcing them to rely on charity or to survive through crime. As if this was ever going to address the underlying structural causes of youth unemployment! It isn’t charity that young people should have to depend on. It’s justice they should be able to count on. And you don’t reduce youth unemployment by increasing youth incarceration. The rejection of these measures reflects the will of the vast majority of Australians. As people of good will all over Australia mark Anti-Poverty Week 2014, I want to propose that we focus on an alternative battle to the one being waged by the government on behalf of the powerful against the disempowered. We have only one enemy. It is called inequality. It’s the meanness of spirit entailed in taking the little that people who are living poverty have in order, supposedly, to reduce the deficit. It’s taking the lamb instead of drawing on 'the flocks and herds in abundance'. You don’t build a strong economy by increasing the level of inequality. You don’t create a strong country on the backs of the already poor. There’s nothing human about humiliating people because they are outside the labour market or on its low-paid fringes. There’s nothing smart about making it unaffordable for people to see a doctor or for their kids to go to university. We are not in the throes of a fiscal crisis but if we embark on this treacherous path of US-style austerity, we will be staring down the barrel of a social crisis. We will be facing a social crisis if the people who bear the burden of inequality, especially the people who are forced into poverty and even homelessness, are made to pay so that the generous tax concessions enjoyed by the wealthy are protected and preserved. We will be facing a social crisis if, as a society, we are silent in the face of these attempts to grind down people’s lives, humiliating them and hurting them instead of helping them. The Prime Minister promised that his government would stand by the vulnerable. The response to his first Budget by ordinary Australians proclaims a very simple and very beautiful message: It is we, the people, who are on the side of the vulnerable. And we will not be silenced. We all have personal vulnerabilities. To be human is to be vulnerable. Many of us are also economically vulnerable, and some of us in the current political and economic situation are very vulnerable; vulnerable to the threat of unemployment, or to losing our benefits, vulnerable to the threat of fewer casual shifts or the loss of penalty rates, vulnerable to losing the place we call home, no matter how humble it may be. These economic vulnerabilities become personal vulnerabilities. Because it’s hard to feel like you have dignity when you can’t afford to eat or when you have no place to sleep. As the Feminist Movement taught us, the personal is political. So our task is to transform our personal stories of injustice into a powerful, collective struggle for a new society; a society in which people are not blamed because economic structures lock them out or, in some cases, lock them up; one in which people are not told that they would not be poor if only they chose to be a little more productive. During Anti-Poverty Week we’re asked to take the side of the people who are made to feel like they are nothing. We join those of us who believe in working towards the kind of society where vulnerability is respectfully shared and supported rather than brutally exploited. We believe that humanity will win against humiliation. Because our solidarity is stronger than our sadness and even though our struggle is enormous, so too is our hope. So many errors and half truths to correct, but someone has to begin. 1) Economic equality is NOT a principle of Catholic Social Teaching. Material inequality is not a problem. It is irrelevant in the fight against poverty. 2) Private sector wealth in Australia is NOT created by stealing the property of the poor. It is created by hard work and ingenuity. So, to answer the opening question: "No!". 3) Government-mandated minimum wage laws are a huge structural barrier to youth unemployment, as the literature attests. It's something Dr Falzon routinely fails to mention as it would queer his pro-big-government pitch. 4) Market capitalism has been the engine for lifting the vast bulk of mankind out of dire poverty over the past couple of centuries. By contrast, regimes pursuing the equality fetish have created misery. North Korea, Venezuela and Cuba are current stand outs in this regard. 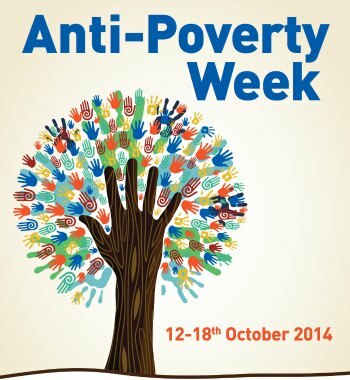 Anti-Poverty Week should make us all reflect a little more deeply about what it means to be truly poor. Our government needs to pride itself on being good social managers of the vulnerable not just say things they don't really mean. I was impressed with our PM's living in an indigenous community for a week recently (even though 'war' seemed to be the hot topic of the week). Perhaps a similar week spent with those struggling to find enough food and shelter may cause a shift in attitude. An invitation to our PM from organisations such as Vinnies could make a difference. Or has that already been tried? Dr Falzon says, “We have only one enemy. It is called inequality.” Really? It was the cry for equality that was a characteristic of the French Revolution and communism, but which brought only the guillotine and the gulag, and impoverishment of the people. It is also is a cry of non-believers who often rage against the perceived injustice of a God who gave his creatures such unequal gifts. However Christianity teaches that to whom much is given much will be required (Luke 12:48), and that the widows two mites outweigh the billions of some rich philanthropist. The cry for equality is mostly a mask for what is really envy and jealousy directed against those to whom God has given more. His assertion that there is no fiscal crisis is disingenuous at best given that the government has been left with a debt-interest bill of over $1.2 billion every month on Labor’s debt. His assertion of our following a “treacherous path of US-style austerity” is laughable in view of the massive US debt approaching $18 trillion, and rising uncontrollably. There is no charity in irresponsible policies and profligate spending that leaves the burden of repayment to our children and grandchildren. HH, if the Catholic Church was given free rein in pre-communist Cuba and now Venezuela to look after the poor, there would have been no need for the communists to step in. A perceptive and salient article. Correctly read I don't think it can be taken as anti private enterprise or anti private property. G K Chesterton, a Catholic and supporter of both, also quite correctly pointed out the dangers of Monopoly Capitalism, where the market is manipulated to the advantage of the few. Economic exploitation is, I believe, considered a sin. Obviously the article, which mentioned the Feminist Movement, drew on much more than just Catholic social teaching or belief. As a sensible, thinking Catholic, the author could not ignore the real world outside the Church. I would commend what I call "engaged" Catholicism, which, from a properly spiritual basis, takes on the problems of the real world and tries to alleviate them. St Francis of Assisi was "one of these", as were the originators of the modern Western hospital and welfare system: mostly religious people in the Late Medieval/Early Modern period. I think we need to bear this in mind. The most effective "revolution" is the gentle revolution. Quakers, with their long history of non-violent resistance to social inequity and oppression are right in the footsteps of Jesus on this one. Marxist communism has repetitively proved itself to be a social and human disaster. Time to get over it, Mr Falzon and find yourself another more successful ideology to follow. Great article. Right on the mark! John, Thank you for a great article. As always, you manage to bring your conservative critics out of the woodwork. Be encouraged by the old air force aphorism, "If you're getting flak, that means you're probably over the target!" Peter Downie. John's call for a war on inequality is way off the mark, giving some of his critics a rod with which to beat him. But who can defend the utter inequity of budget changes which lie heavily on the poorest, while the changes barely touch the well off? Or praise the economic myth of the 'trickle down' theory which has worked well only in China? Mr. John Falzon, Australia is a free and democratic country and you have the freedom and the right to promote your own ideology. But for the good of the Saint Vincent de Paul Society, please resign from the top position you hold at SVDP. You are doing a lot of harm especially to the men and women who are members of the Society, who are loyal and do a lot of good work and do not accept your left wing ideology. Thanks for the article, John. Keeping being a voice which challenges people. I fully support what you are saying. "Thank you John". You are so spot on and a man that walks with the us and understands. You recognize the dignity and capability within each one of us. The state has responsibility in this as do each of us. Support and do not stigmatize the marginalized,single parents and disabled. Give our youth a fair go. May I add including a right to affordable education and university. My kids stressing "terribly "over Uni costs and turning away. Australia's current and proposed polices will ONLY make things tougher and MORE inequitable. We are human beings and will flourish give the right opportunity and love. But Government currently turning away in times of need! We are not simply economic tools of the state. Let us raise our families -in love. Support families , do not clip our wings or that of our kids. Allow us to determine our futures. Please continue to hold firm . That the rich are becoming richer is true. That Middle class families are struggling is true. That we have the working poor is a reality in this, one of the richest OECD countries in the world. That we did this by dispossessing Aboriginals is also true. John--as the chief of an organisation which relies on the goodwill of many individuals and Companies and government for the funds & benefits which enable it to carry out its good works---I believe your continuos rantings are unhelpfull to the cause. While we strive to survive in Australia in the midst of a region where a billion or more people have never heard of pensions or social security payments & work for very little--our governments will have to modify our expectations at all levels in the future--what a challenge !!! John, congratulations on the tenacity and commitment you bring to your advocacy on behalf of struggling Australians. Despite the rubbishing you always get from the usual suspects, you have the authority and validation of the Catholic Social Justice Gospel to support you. Liberal free market Capitalism with that smoke screen it calls the 'trickle down' effect has no corporate moral conscience whatsoever. It doesn't even stand comparison with decent secular humanism. It continues to sacrifice the human work force and the families dependent on it upon the altar of the 'interests of the shareholders.' That's about as close as free market capitalism gets to the human condition. . The great St Maximilian Kolbe on equality: "Whenever I feel that it is useful, proper and prudent, I stop and talk about the inadequacy of socialism. . . When he sees the luxurious residence or the charming country house of a wealthy person, a poor workingman often asks himself: ‘Why do I not possess such wealth, too? Why is there such inequality in this world?’ How many volumes have been written about equality among men! How much blood has been spilled for this idea! And yet, in spite of it all, we still have the rich and the poor. Four years ago I passed through Moscow. As the train was scheduled to stay there for a few hours, I got down from the railway car to visit the city a bit, hoping to see for myself how the slogan, so highly publicized and so widely proclaimed, of equality and the common possession of goods, was worked out in practice. But even there I found some people clad in rags, while others wore elegant clothes cut in the latest style. So not even in the Bolshevik state have they succeeded in bringing about equality. Let us imagine, however, that one day all the inhabitants of the world would assemble to put into effect this sharing of all goods; and that in fact each person, granted that the world is very big, received an exactly equal portion of the wealth existing on earth. Then what? That very evening one man might say, ‘Today I worked hard; now I am going to take a rest.’ Another might state, ‘I understand this sharing of goods very well; so let’s drink and celebrate such an extraordinary happening.’ On the other hand, another might say: “Now I am going to set to work with a will so as to reap the greatest benefit I can from what I have received.” And so, starting on the next day, the first man would have only the amount given him; the second would have less, and the third would have increased his. Then what do we do? Start redistributing the wealth all over again. . . To continue the argument, even if there were only two persons in the world, they would not succeed in maintaining absolute equality; for in the whole universe there are no two things completely identical in every respect. . . This is how it has been, how it is now and how it will always be, simply because man will never attain absolute perfection. In spite of all this, the human mind still desires to bring about a certain equality among men. Is there any possibility that this can happen? Yes, no doubt. Every man, whoever he is, whatever he possesses and whatever he is capable of doing, owes all this to God the Creator of the universe. Of himself man is nothing. From this point of view all of us are absolutely equal. Furthermore we all possess free will, which makes us master of all our actions. This too constitutes the basic equality of all men on earth." (The Kolbe Reader 11, 131-132). I write in support of John's call to arms. Who can argue against a fairer distribution of wealth not only in Australia but throughout the world? But we are up against the fact that there is a little bit of bad in the best of us. This bad manifests itself in various way but fundamentally it all gets back to selfishness. The Jesuits in their educational endeavours try to mold their students into "men and women for others". I am sure they would be the first to admit that it is not an easy task with varying degrees of success. But they continue to try. I see John Falzon as "a man for others", with a preference for the most needy. This preference may leave him open to criticism regarding his exuberance and his generalisations about the comfortable classes but like Don Quixote he keeps charging at the windmills as he sees them. Ole! I won't test the 200 word limit to justify any criticism. A well expressed article by John Falzon, with compassion and reality. To the critic who called for John's resignation, sir, are you willing to step up to the plate and put your actions where your words are? I thought not. Doing is harder than criticising and SVDP is doing the hard yards where it counts. Read the article again with an open mind. "Furthermore we all possess free will, which makes us master of all our actions". What a relief to hear the wisdom of St Maximilian Kolbe: we don't need to concern ourselves too much with those fleeing Christians in the Middle East - master of their actions as they are, they can be left to their own devices. Russell, note that St Maximilian says we are masters of *our* actions - those that determine our character and eternal destiny - not those actions of any murderous nutjobs around us. As you know, this was a bloke who was sufficiently master of his own actions to take the place in the execution line of another man and submit himself to the lethal actions of Nazi nutjobs, to spare that man's life. It chokes me up to even think about what that would take. With respect, you frequently have interventions to make, and although I rarely agree with them, they are part of the rich fabric of Eureka Street. Are you not, however, using a literary burqa by concealing your name from the rest of the Eureka Street community? "we are masters of *our* actions - those that determine our character " - HH can I recommend that you read up about genetics? And is a child suffering from FASD the master of his character? Or a little less obvious - a child who grows up in a dysfunctional family/community that isn't capable of seeing that s/he is educated in any kind of way? Not everyone is equally endowed with talents, and wealth, and opportunities at birth. We don't all suffer or enjoy the same good or bad fortune as we go through life. You can choose 'the law of the jungle' as your credo, or something more Christian. While Maximillian Kolbe's personal holiness is publicly recognised by the Catholic Church, his views on political systems particularly socialism were no doubt heavily filtered through the collective Polish Catholic understanding of Marxist Communism. Similarly, his at least de facto acceptance of "The Protocols of the Elders of Zion" would reasonably place aspects of his judgment in question on that matter and perhaps on many others too. Yes, Russell, God give us each a combination of talents, temperaments, abilities or disabilities and circumstances when He creates us. By "character", I mean the person we become through our choices, working with whatever we've been given, positive or negatively viewed. Even something as challenging as demonic possession cannot not prevent us from shaping our inner character as the holy lives of Antoine Gay and Helene Poirier in 19th century France attest. 'Demonic possession', HH? Surely that went out with Earth-centred cosmology, miasma theory, and death 'by visitation of God'? I was forced onto welfare with 4 children in tow in 1970s. I did budget course to arrange payments for services. It was tight but workable. My children had no extras. Their father and consequent wives held high profile jobs. He contributed a pittance for 4 children. I have worked between but not enough to have independent superannuation. I am on Age Pension. I always do volunteer work to contribute to society. Young people cannot live on nothing but need to find a way to contribute. Hanging around talking gets nowhere. Depression can be prevented by care of themself, inner self esteem, self-discipline and doing the best they can. At home learn to look after household and others. Fill in forms. These are all life skills. With this attitude young people deserve welfare and health cover. Equality is having needs met, not wants. Better tell Pope Francis demons are myths, GM - there's a youtube of him performing an exorcism last year on a young man believed to be possessed by four demons. Now Ginger Meggs, you know that this is right: "Even something as challenging as demonic possession cannot not prevent us from shaping our inner character". I myself have been possessed by a chocolate-demanding demon for years, and the struggle goes on, sometimes it wins (like just now), sometimes I do. But then I probably inherited this demon from my diabetic forebears - all driven to lolly eating excesses. Now Russell, I can identify with your sort of 'demons' and their rational explanations. But HH's 'demons' as explanations? And 'exorcism' as treatment? Surely they, along with earth-centred cosmology etc are all a bit outdated in the 21st century? (Catechism, Art. 1673) "When the Church asks publicly and authoritatively in the name of Jesus Christ that a person or object be protected against the power of the Evil One and withdrawn from his dominion, it is called exorcism. Jesus performed exorcisms and from him the Church has received the power and office of exorcizing. In a simple form, exorcism is performed at the celebration of Baptism. The solemn exorcism, called "a major exorcism," can be performed only by a priest and with the permission of the bishop. The priest must proceed with prudence, strictly observing the rules established by the Church. Exorcism is directed at the expulsion of demons or to the liberation from demonic possession through the spiritual authority which Jesus entrusted to his Church. Illness, especially psychological illness, is a very different matter; treating this is the concern of medical science. Therefore, before an exorcism is performed, it is important to ascertain that one is dealing with the presence of the Evil One, and not an illness." "all a bit outdated " - I hear you, Ginger Meggs! What's really worrying is this concept: " ... from him the Church has received the power ... " [it wasn't me who used a lower case h there]. Well, they would say that wouldn't they? Seems to me that's probably falling into the biggest sin of all. Thanks HH; that demonstrates my point perfectly! But how do you actually detect the presence of the 'Evil One' and distinguish it from an 'illness'? And how do you know the exorcism has been successful? Do you weigh the exorcised before and after? My point is that (presumably) Catholics are no longer 'required to believe' in an earth-centred cosmos, or in miasma theory, or the host of other false explanations of natural phenomena based on less complete understandings of nature: why then does the requirement to believe in 'Demons' persist? In pursuing this line I'm not just trying to take the mickey out of your beliefs but rather to suggest that legalistic focus on matters that are at best conjecture only gets in the way of the real insights that the church could offer into the human condition. Thanks G.M. - I know you're not joking, so no offense taken at all and your questions are perfectly reasonable. But can you tell me when Catholics were required as a matter of faith to believe in "miasma"? As for demons leaving a person, well, weighing would do no good and no theologian to my knowledge has ever claimed as much. Why should it? According to traditional theology, demons are angels - though fallen. They are thus pure spirits, hence not material in any way, so cannot have weight. They are not "natural" phenomena, though in ages gone by they have been regarded as the causes of what much of what we now ascribe to natural laws, especially in the area of diseases and other afflictions of the body. So what? People miscategorize things all the time. That doesn't prove the categories don't exist and apply to some cases. Finally: as to telling whether a person is possessed, there are several tests. One is the fluent use of human languages the possessed couldn't have possibly known. Is there a psychological condition which brings this on? The repeal of the burka ban in parliament followed woeful comments from ignorant senators and an obvious lack of real government consultation with Australia’s Muslim communities, spotlighted an embarrassing level of illiteracy with regard to Islam. We need to move beyond a token religious ‘tolerance’ that is paired with incomprehension of the religious other, towards promoting a more engaged understanding that entails some comprehension of how religious and other cultural traditions fit together. The Synod was reported in some media as a defeat for Pope Francis at the hands of conservative bishops. Yet for one who had suffered a defeat, the Pope seemed remarkably buoyant at the end of the event. It's likely that he saw it as a victory for his vision of church governance, as it allowed participants to engage in open discussion in which nothing was put off bounds.